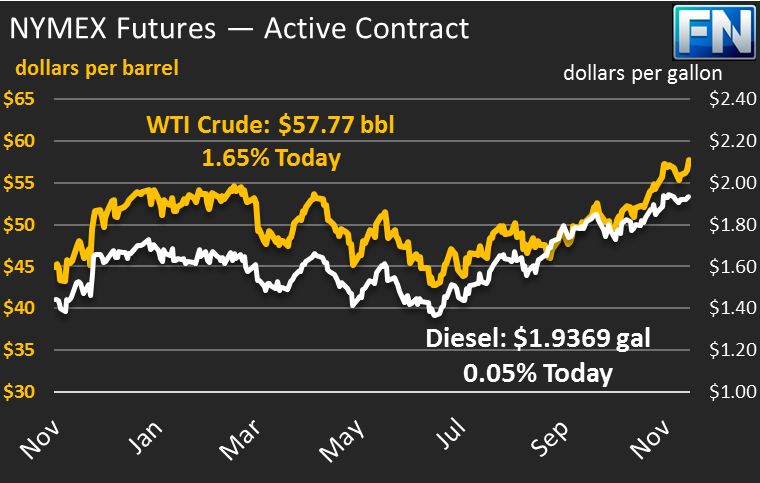 Crude markets saw some small gains yesterday, boosted by an API report showing a 6.4 million barrel stock draw, far more than market expectations. Crude prices gained 45 cents yesterday, rising steadily higher throughout the day after a down day on Monday. This morning, crude oil prices opened with a bang, jumping 29 cents overnight to open above $57 and rising higher to peak above $58 for the first time in over two years. A significantly less bullish EIA report caused markets to reverse some of their gains, and crude is currently up just 94 cents (1.7%) from yesterday, trading at $57.77. Refined products have seen similar movements this morning. After opening this morning with moderate gains, diesel prices are currently trading in line with yesterday’s close, at $1.9369. Gasoline prices managed to surpass $1.78 for the first time since last week, but are down this morning to $1.7696, a loss of .35 cents (-0.2%) from yesterday’s close. Typically, markets are relatively calm on the day before a major market holiday, but today is shaping up to see some relatively large price action with the highest trading volumes of the week. The EIA’s report is leading markets lower this morning. The report was significantly less supportive for prices than the API’s report, which showed a massive draw. Crude exports rose nearly half a million barrels per day (MMbpd); without those export gains, crude inventories would have seen a build this week. Refinery utilization continues climbing, reaching 91.3% this week – high output from refineries has helped keep inventories high, especially along the East Coast, where diesel and gasoline inventories combined rose 3 MMbbls. Inventory draws in the Gulf Coast and Great Lakes regions helped to keep national refined product inventories to meager gains. Looking internationally, Russian officials are beginning to warm to a deal extension, though the current consensus in the largest non-OPEC deal member is for a 6-month extension of the deal to September 2018. Markets have been expecting a 9-month extension for weeks, so a 6-month extension would likely be a disappointment for markets. Still, the fact that Russia is no longer threatening to punt an extension down the road helped markets rise higher earlier this morning. The Keystone Pipeline, which experienced a leak last week, remains offline. Estimates show 85% reduction in deliveries through the end of November, though TransCanada has not given any official indication of when normal operations will resume. Yesterday, reports came out that at least one refinery in Illinois reduced run rates due to the pipeline issues. The pipeline outage reduced flows to Cushing, OK, the delivery point for WTI crude oil. The supply concerns caused January crude oil contracts to trade at a premium to February oil, the first time since May that 2nd month prices have traded below prompt month prices.